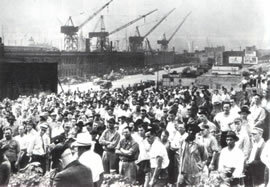 120,000 shipyard workers strike in 1947. Photo from Labor Press Associates. The United States has the longest organized labor movement in the world. Labor unions have been in existence since the late 1800s. The main goals of labor unions in the U. S. have always been to improve wages, working conditions, and benefits for American workers. Following the end of World War II a huge wave of strikes swept across the United States. During wartime, unions had promised not to strike to keep defense production running smoothly. But soon after the war ended, unions across the nation began demanding new contracts. As a result, 1946 saw a record number of strikes. Congress worried that labor unions were becoming too powerful and in 1947 it passed the Taft-Hartley Act. This controversial legislation greatly reduced the power of labor unions and the number of strikes in the 1950s dropped considerably. Click on PICTURES below see an additional photo of a 1950 strike in Dayton, Ohio, where the Ohio National Guard was used to break up a labor demonstration.